More House Before and Afters.. A Willett Wedding…. Okay guys, my brain is spinning and I need some discussion from you on the matter. Actually, my brain won’t shut up on several topics, but this is one that I cannot find my way on. First off, as you know, I am a retired Petroleum Geologist. Many people out there think energy companies are the worst of the worst. When people, outside the Oklahoma and Texas area, find out what I did in my working life, the first thing they mention is global warming. The second thing they mention is that they are “green”, environmentally sensitive or “care” about our globe. I must admit, they are always surprised that I also care about the world and our environment. As an aside, in the 80’s the question I most often got was “how can you be a geologist and a Christian?”. That was actually an easier discussion for me. The heatwave in the northeast and the fires in California were both lead stories all week on the national news. Climate change and the reason for it were covered in depth. This always sets my brain in “figure it out” mode, so let’s get right to the thing that I want you to weigh in on but please remember that this is a brain dump. Cheap clothing and its impact on pollution, global warming and the health of the people in the manufacturing trade. What my mind keeps telling me is that there has to be an impact on the environment with all the cheap clothing. Also, my mind gets cranky by all the STUFF we all seem to think we need. I, by nature, am a minimalist, but even I was shocked by how much we gave away before we moved! Here is a link to my post about our STUFF. I just do not know if it is worth a $7 T-shirt purchase when I think about the fact that we are using precious resources to manufacturer and then ship the T-shirt across the ocean. How does that make sense? How many times will I really wear that T-shirt before it goes to charity? Could I maybe wear it a few dozen more times? See how my freaky mind works? How does it make sense to manufacture all our goods in Asia and then ship them on cargo ships to the United States and then distribute them to warehouses and then sending them out to all those stores? I do not think we are using solar ships and wind powered trucks to handle the job! I recently went to buy a toaster and a coffee pot to replace our old ones. I was not successful in finding either that was manufactured anywhere near the USA. How much petroleum product was used to send those items across that ocean? Again,I do not think they came by sailboat or canoe! On the human cost, it is so much easier for me to answer. People that are manufacturing our clothing in “other” parts of the world are dying from it. Their deaths result from working in conditions that we wouldn’t let our animals live in. The lack of safety features is one reason the $7 T-shirt is even around. The cost is too much for me. Okay, I want some feedback. Where do you buy your clothes? Does price matter most? This is not a gotcha post but rather my brain talking to me and NOW to you. Back to regular programming. 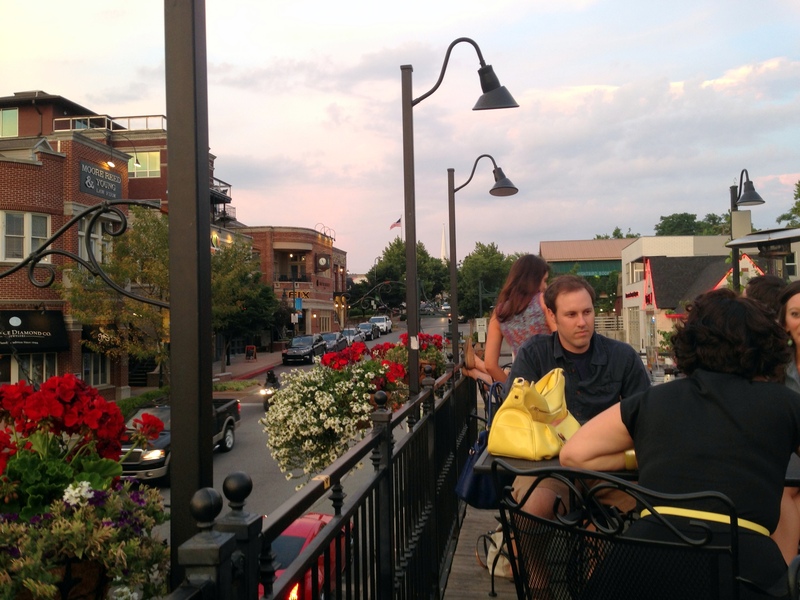 We had a wonderful weekend with unseasonably cool weather. We tried to be outside as much as we could. 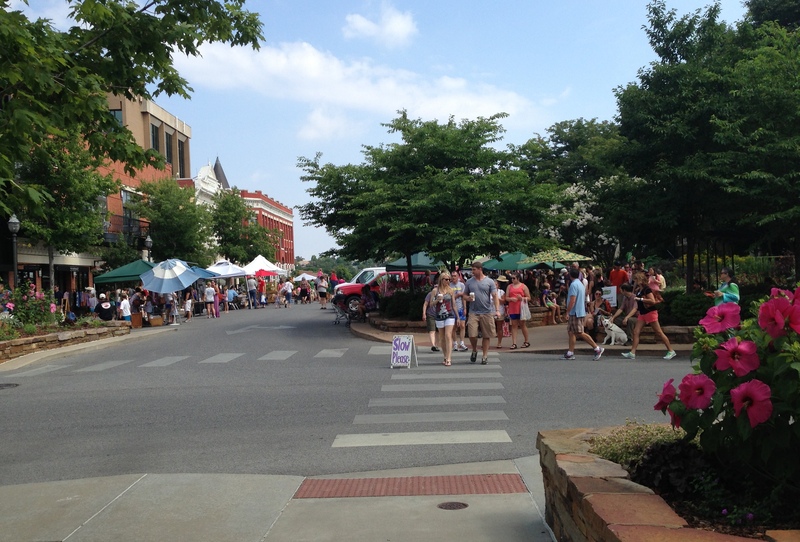 A trip to the nearby bar and farmer’s market provided both great music and wonderful people watching! The farmer’s market had wonderfully tasty, locally grown peaches! My day was made. First, let me just say I can’t believe I missed your last blog post with the before and after pictures. 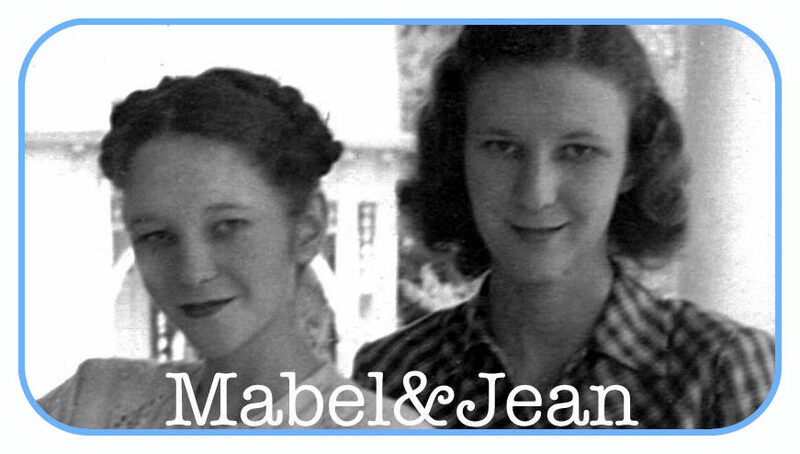 I’m an avid Mabel & Jean blog follower (it’s the only blog I follow :)!! I’ve been fortunate enough to see the before and after of the house in person and the after is incredible. The pictures that Cathy took are great, but they just don’t do the house justice. Every room is just gorgeous!! The bathroom looked good in the pictures, but it’s beautiful in person. The kitchen is fabulous and the “back room” is warm, cozy and just makes you want to sit on the couch and watch a movie. Fayetteville is just so much fun, too!! I feel like I’m a minimalist, too, and just don’t understand the need for so many clothes. I would much rather have a few expensive pieces (like I bought in Fayetteville) and wear the heck out of them rather than a closet packed with a ton of stuff that I only wear a few times. I would be willing to pay more for clothing than to think there is a child in a third world country sweating over something that I’m going to wear. We complain about the size of the closets in older homes, but really, do we need big closets anyway?? China may have overtaken the U.S. as the world’s largest manufacturer, but we still make stuff here! And that includes basic clothing items. American Apparel is a popular example of a ‘homespun’, vertically-integrated retailer. Their clothes are made in L.A., and therefore skip all of the energy intensive distribution and torturous working conditions of overseas labor. The prices are competitive, the customer service is good (if you stay out of their stores, like the one on the Plaza, that seem only to be staffed by heroin addicts) and the quality is ok. For better quality (and more expensive) basics, American Giant is a new company for indigenously manufactured clothing. I can highly recommend them! I think an important point in the whole “green” debate is that we do not have to go backwards to be environmentally responsible. We can use our ingenuity and intelligence to create better systems that work with the environment instead of against it. I will have to check them out. thanks Nicholas. Okay, Nicholas told me that I’m not really a minimalist, but probably more like a minimalist wannabe. I have to agree with him, but I’m working on doing better! That made me bust out laughing! I’m a minimalist wannabe too! I’m with Charlotte on clothes. I do put money into the few pieces I have and it does pay off, I’ve had my favourite cashmere turtlenecks (black or course) for at least 9 years now. Quality, not quantity. Regarding being given a difficult time about your career: uh-huhm. Do these people own cars and drive them? Well, there you go. Do they use perfume? Wear makeup? I think they are picking on you out of their own guilt and out of ignorance. We all want to be green but it is sooo difficult knowing how everything is made and wear it comes from! OH! Please post outdoor/outside photos of the house too! AND congratulations on the peaches; peach season is the highlight of summer. I wish I remembered how to can fruit.